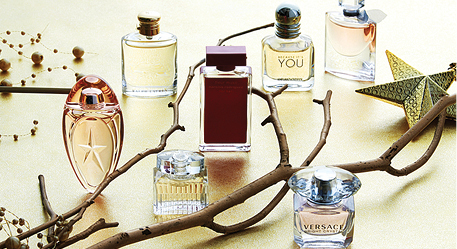 If you happen to already know which scent your bestie, your lover, your Mom or even your brother-in-law likes to wear, you can always stock them up with a repeat fave this season. But let’s be honest, that’s kind of boring, no? More intimate and impressive: helping them discover the new scent they’re suddenly going to live for. “The trick is knowing what they’re bound to like, because what you love, they may hate—and vice versa,” says Marian Bendeth, global fragrance expert for Sixth Sense. Here, the pro doles out her top tips for finding a hit fragrance sure to give ’em all the right feels. 1. Check out their wardrobe. 2. Look a little deeper. If the giftee is a shy person—say, they’re the quintessential wallflower in a group setting—you may want to choose subtler versions of fresh, citrus, green or woody scents, says Bendeth. On the other hand, if the person is strong and opinionated (you know who they are), louder, floral/orientals might be a better match. The Ariana Grande-loving Gen Z niece on your list will probably go for punchy, fruity notes like green apple, watermelon, pink passion fruit or cherry, says Bendeth. Look for edible notes of caramel or toffee as well. Popular among millennials? Fruity floral combinations that fuse leading notes of raspberry, blackberry, peach or lychee with middle notes of peony, jasmine or rose. 4. Don’t forget the guy on your list. 5. Bet on a winner. When in doubt, rose is the magic note most often topping best-seller lists today. And according to Bendeth, that single sweet-smelling ingredient can be spun in many directions, from fruity to green and warm to spicy, to suit many different personalities. 6. Pull the safety card. If you really want to be sure your gift hits it out of the park, you can always go in for a Fragrance Mini Coffret & Certificate For Her (also available for him), which includes 1.5 mL minis of Versace Bright Crystal, Giorgio Armani Emporio Because It’s You, Ralph Lauren Women, Lancôme La Vie Est Belle, Chloé Chloé, Narciso Rodriguez For Her Fleur Musc and Thierry Mugler Angel Muse. Plus, the grouping of adorable bottles comes with a certificate that can be redeemed for a full-sized fave once your VIP person decides what they like. Seriously, you got this. To receive push notifications, make sure you opt-in during your initial App launch. Or, if you already have downloaded the App, you can opt-in to receive push notifications from the App Home Screen by clicking “More” > ��Settings” and then sliding the dot to the right.